Another month has passed and it’s time to reveal what the expenses and passive income were for October. My quest to become a full entrepreneur becomes more apparent as the months go by. My net worth seems to be rising at a much faster rate compared to a year ago. It was very hard to save that first 10K, but it was interesting how much faster I turned 10K into 20K. I am hoping to turn 20K into 30K at an even faster rate by making my money work for me. It’s easier to start building your net worth when you have multiple sources of income. For example I have income coming from a first shift job, a third shift job, dividends, interest, credit card rewards, CD’s, and Ebay. I also have a 2.5% matching contribution on a 401K plan for my full time job. So you can see how I have started a mini foundation of building wealth. I am not saying that building wealth is easy and it’s actually quite hard. 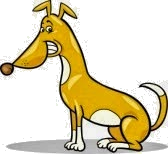 You will always run into a few hiccups while trying to build your wealth. October was a very expensive month for me but the money I spent was very minimal to what I could have spent. Sometimes you will need to replace your appliances and fix your car. It just so happens both of these issues occurred in October and I am glad that I was able to get it out of the way. I am hoping to finish the year off strong with November and December to look forward to. I am glad to be a part of a community that helps to lift each other up. It really helps me to stay focused and I don’t think I would be doing as well if it were not for the great bloggers that put a ton of work into their writing. Here are the expenses for the month of October 2014. *These are expenses that are split between my significant other and I. Now let’s take a look at all of my passive income for the month. This month my passive income was much better than I expected. The passive income made up for the heavy spending this month. I am hoping that the passive income will keep increasing every month and will try to keep expenses a little lower for the last two months of the year. The cash back rewards have been a great help because I have been using that money to reinvest into more shares. These cash back rewards are passive income because I don’t have to work extra and I am not holding a balance on my credit card. Therefore each month I am getting free money that I can receive in a paycheck or put it towards my current balance. 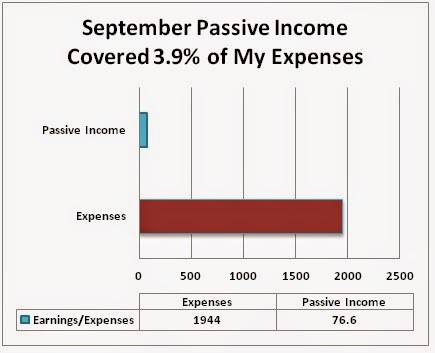 Now let’s see how much of my expenses were covered by the passive income. How well did you do in October? Congrats on the passive income, DM. Slowly but surely that will increase over time....keep it up! Thanks for the words of encouragement. I am hoping that the passive income will be over 100 on a monthly basis. I think that would be a great indication of how well I am doing. December will be a big month for passive income because many companies pay out. Should be well over 100! Hey hey hey! That little blue bar is getting thicker! Congrats on a good month! It is exciting to see that my consistency is starting to pay off. It would be awesome to have the blue bar at the same level but it will take some time. I just have to continue staying motivated. It seems like the passive income is finally starting to take off. I think November might be a slower month but I am hoping to add more companies on the lagging months. SBUX is on my radar which pays out in November and with the recent dividend increase I feel they are a great long term play. That passive income is slowly getting higher! Keep at it! Thanks Henry. I want to finish the year off strong by completing some of my goals for the year. Next year should be great when I calculate my yoy passive income and seeing the chart helps look at the progression. Congrats on the great month Mongrel. Once the snowball gets rolling, it gets larger at a much faster rate. You are taking many of the right steps and will reach your goals in no time if you keep it up. $30k in new worth will arrive much faster than you are anticipating at this pace!